You might get a sense of where Adam Sandler’s latest movie is headed as the first scene opens to the sound of a toilet flushing and the sight of his co-star, Drew Barrymore, exiting a public restroom stall. Blended marks the third time Sandler and Barrymore have worked together, after The Wedding Singer and 50 First Dates. This time around, they play a couple of single parents whose blind date—at a Hooter’s—is a disaster, but who later end up, in one of those only-in-the-movies contrivances/coincidences, “blended” together with their respective kids at a luxurious African resort. Sandler’s tastes in humor have never exactly been hallmarks of high refinement, and by now even most of his fans realize that he seems somehow incapable of evolving to a more enlightened state. There are a lot of things wrong with Blended, but the biggest is that it drags so many younger actors down to Sandler’s crude, bathroom-humor level, all in the name of a “family” comedy about family togetherness. Sandler’s character, Jim, has three daughters; Lauren (Barrymore) has two sons. So when they all end up together in the Dark Continent, it’s like an episode of the Brady Bunch, only with cutaway shots of rutting rhinos and jokes about cleavage, buttholes and crotches. It’s hard to hold the “children” in the movie responsible for the actions of the adults, particularly Sandler, director Frank Coraci (who also directed him in The Waterboy, 50 First Dates and Click) and the writers, who concocted not one scene, but two, in which Jim’s youngest daughter (six-year old Alyvia Alyn Lind) gets to chirpily mispronounce a certain feminine body part as “bagina.” Isn’t that adorable? 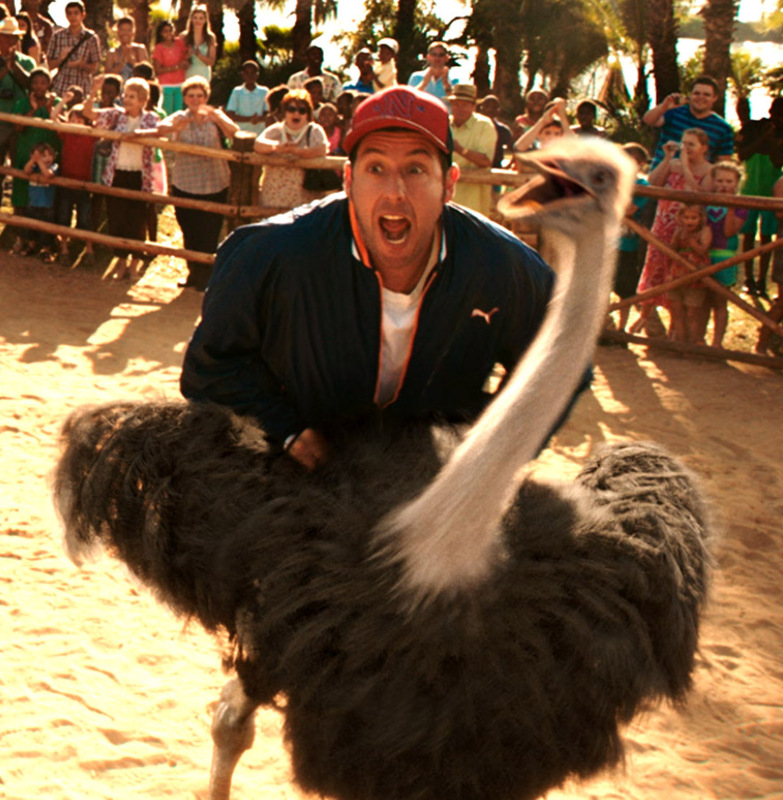 Sandler, 47, plays the same wisecracking, goofball man-child schlub he’s basically played in every movie. Barrymore is adorable, but given little of substance to do outside of being his second banana, filling the necessary “female” role. The two of them do have a natural, relaxed chemistry, and some of their scenes together in this rom-com reunion, especially when Sandler’s not gobbling every punch line in sight, have a warm, unforced sweetness that almost feels like something from another movie entirely. It’s just too bad that those little seeds of sweetness are buried beneath such a heaping mountain of comedic crap. For every genuinely funny, clever line, there are three dozen moaners. Technically, the movie’s a mess—it looks like it was shot, staged and edited in a mad rush. And it’s depressing to see such a big cast, including Shaquille O’Neal, Saturday Night Live alum Kevin Nealon, Wendi McLendon-Covey, Joel McHale and Terry Crews, yukking around in such muck. “Is this a sick dream?” ask Sandler’s character at one point. After watching a movie that begins with a flushing toilet and ends with kids singing a song about poo, pee and “juicy farts,” it sure might feel that way for his audience.